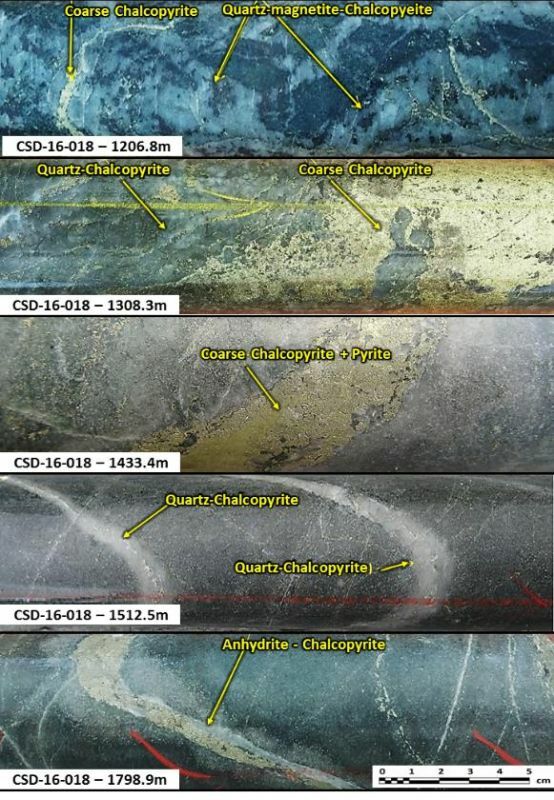 Cornerstone Capital Resources Inc. ("Cornerstone" or "the Company") (TSX VENTURE:CGP) (FRANKFURT:GWN) (BERLIN:GWN) (OTCBB:CTNXF) announces the following project update for the Cascabel copper-gold porphyry joint venture exploration project in northern Ecuador, in which the Company has a 15% interest financed through to completion of a feasibility study. SolGold Plc is funding 100% of the exploration at Cascabel and is the operator of the project. Drill Hole CSD-16-018 ("Hole 18") is at a depth of 1829.7m, extending the lower portions of the Alpala deposit, and supporting the existence of the deepest mineralized intrusive body discovered at the project to date. Drilling continues towards a planned depth of 2300m. 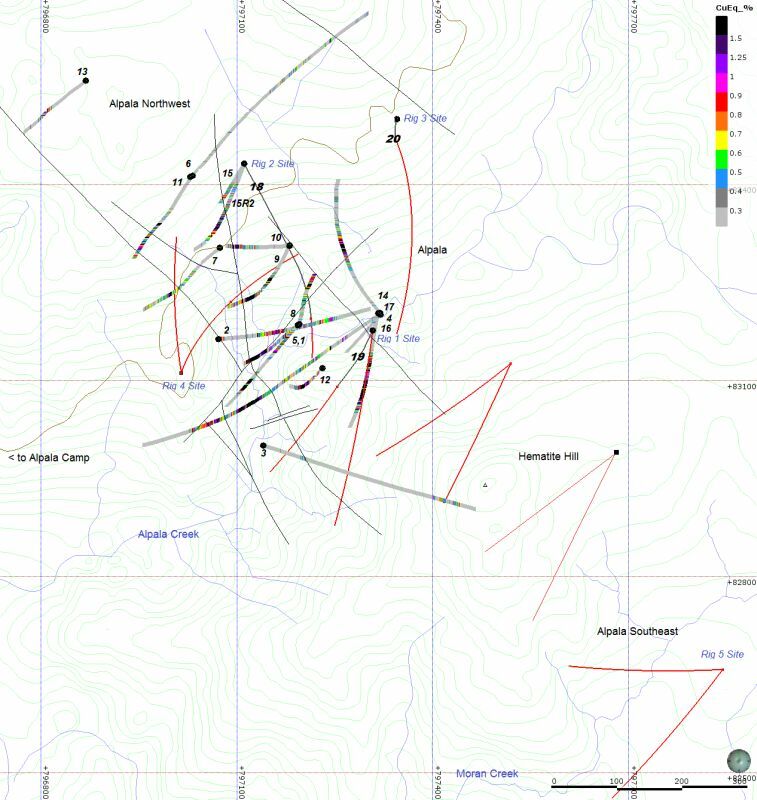 Hole 18 has intersected copper mineralization from 903.9m to the current depth (a 925m intersection, with an estimated true width(1) of 667m), including a 330m intersection (estimated true width 237m) of intense quartz - copper sulphide veining, from 1179.7m to 1509.3m. Drill Hole CSD-16-019 ("Hole 19") is at a current depth of 727.9m. Drilling intersected copper mineralization from 473.1m depth (a 254m intersection, with an estimated true width of 183m), which continues at current depth. Bornite, a 64% copper sulphide mineral, occurs from 668m depth in Hole 19, supporting the existence of the shallowest mineralized intrusive body discovered at the project to date, and extends the upper portions of the Alpala deposit above Holes 12 and 16. Drilling continues to the planned depth of 1600m. 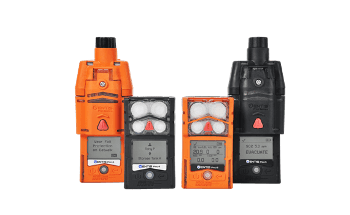 Drill Hole CSD-16-020R ("Hole 20R") is at a current depth of 676.7m, as drilling passes through hydrothermal breccias and volcanic rocks towards the deepest richest portion of the Alpala Deposit, some 600m below known mineralization. Mobilization of an additional, large, track mounted, deep hole directional Sandvik DE880 top drive drilling rig ("Rig 4") has begun. Engineering and building of a third, custom, deep hole directional man-portable Hydracore drilling rig ("Rig 5") with depth capabilities up to 2600m is underway. An Independent Technical Report on the Cascabel Project is in preparation under National Instrument 43-101 and accompanying Documents 43-101F1 and 43-101CP by SRK Exploration. (1)Estimates have been made in defining true widths due to insufficient drilling in the outer limits of the currently known extension of the Alpala deposit and drill results not having yet been assayed and interpreted. These estimates may change as more drilling is completed and results continue to be processed. The Cascabel Project is located on the gold-rich northern section of the prolific Andean Copper belt renowned as the production base for nearly half of the world's copper (Figure 1: http://www.marketwire.com/library/20161222-fig1.png). 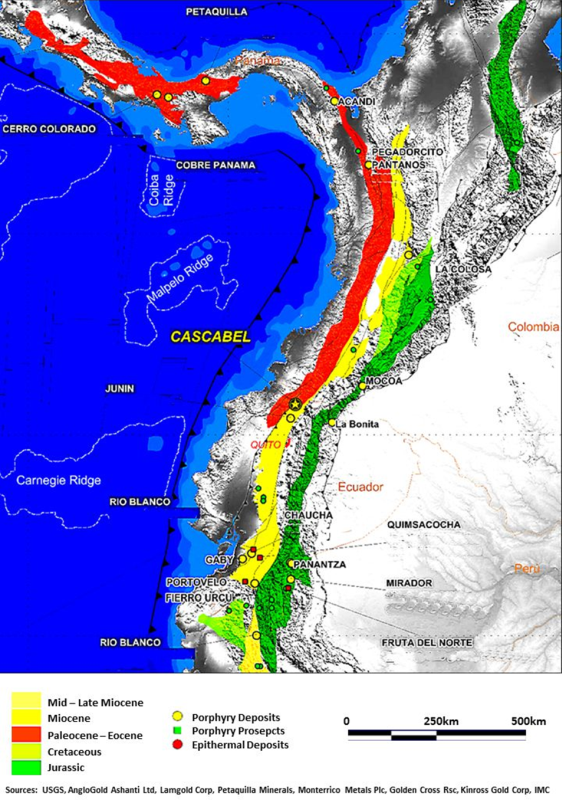 The project area hosts mineralization of Eocene age, the same age as numerous Tier 1 deposits along the Andean Copper Belt in Chile and Peru to the south. 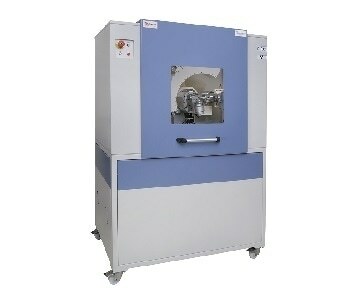 The project base is located at Rocafuerte, in northwestern Ecuador just west of the City of Ibarra, approximately 3 hours drive north of Quito and close to water, power supply and Pacific Ports (Figure 2: http://www.marketwire.com/library/20161222-fig2.png). SolGold holds an 85% interest in ENSA (Exploraciones Novomining S.A.) which holds the Cascabel concession. 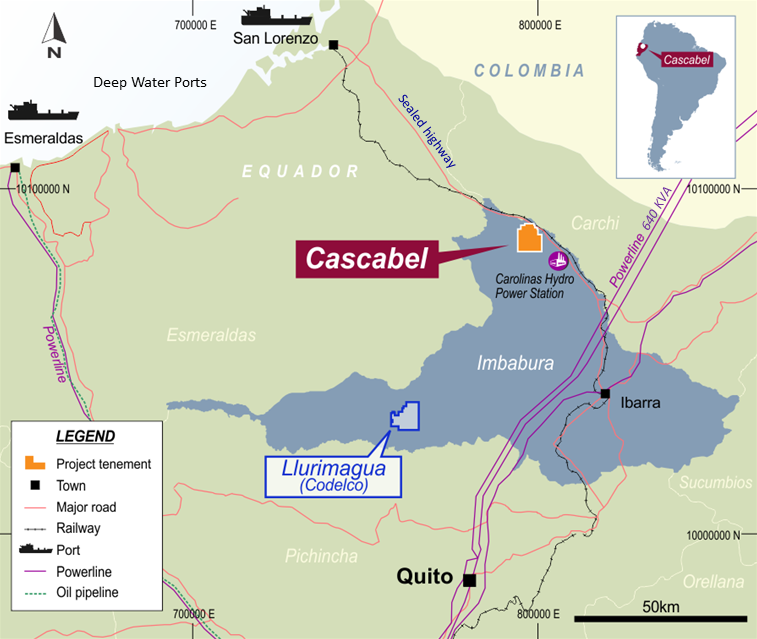 Fourteen different targets have been defined at Cascabel and only one of these, the Alpala Deposit has been drilled to date. The deposit at Alpala continues to grow with each new drill hole. 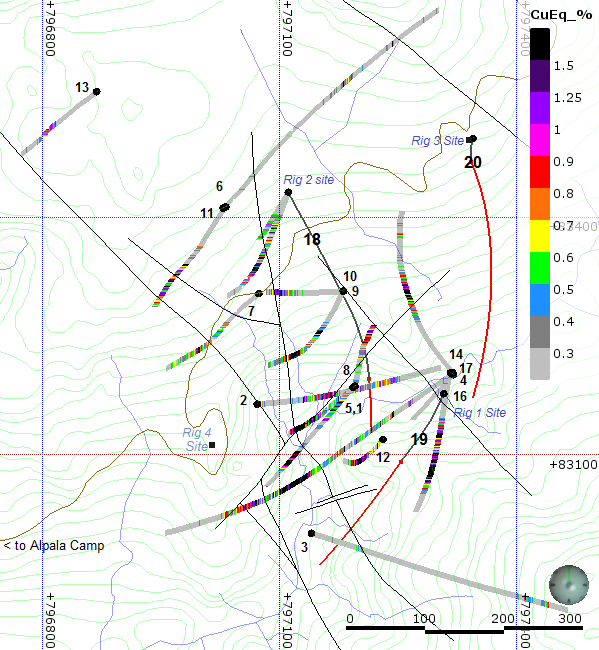 Drilling has focussed on defining the geometry of the Alpala deposit, which is open in all directions. Over 26,850m of drilling has been completed to date (Figure 3: http://www.marketwire.com/library/20161222-fig3.png). Planned drilling for the coming quarter focuses on expansion of the Alpala deposit as well as testing of the south easterly extensions of the greater Alpala system, at Hematite Hill and Alpala Southeast. 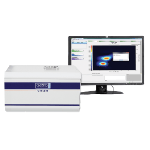 (Figure 4: http://www.marketwire.com/library/20161222-fig4.jpg). 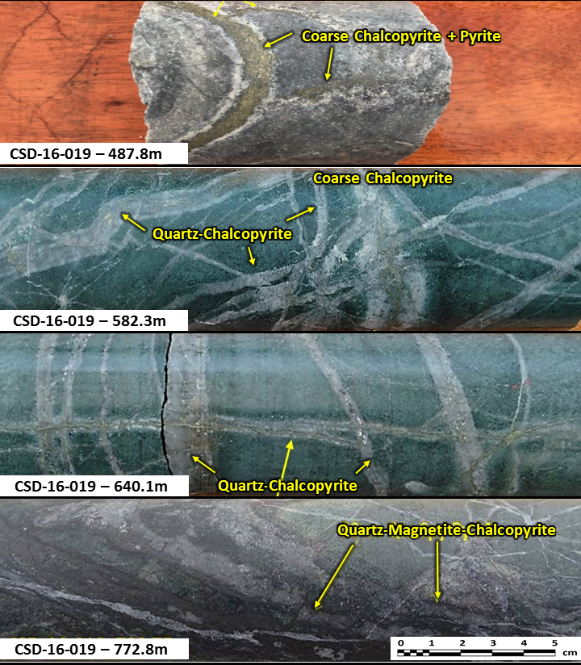 Examples of selected mineralization in drill core intersected to date in Holes 18 and 19 show intense porphyry style veining and associated visual copper mineralisation (Figures 5 and 6: http://www.marketwire.com/library/20161222-fig5.jpg; http://www.marketwire.com/library/20161222-fig6.png).